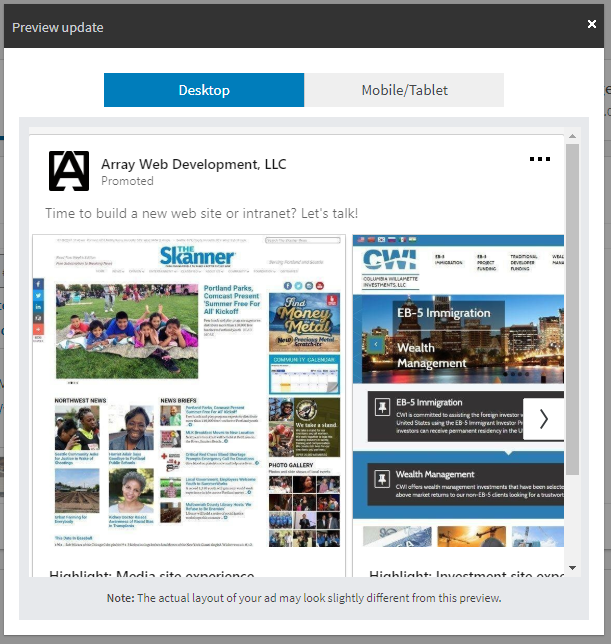 Over the past few weeks, I took a few of the major social media ad platforms for a ride, to compare them and have a look at the results. To be frank, I’m rather uninspired by both. I have no idea what that photo, above, means, by the way. But, somehow, it illustrates pretty well how I feel about Facebook and LinkedIn ad platforms (at the moment). (I found that pic on the Unsplash system by typing “sad.”) Anyway, here’s why I’m not too excited about either platform at this time. I started on FB because it’s the social media leader. Everyone is there, and it allows decent targeting for ads. Plus, I’ve heard many other agencies rave about the ROI there, at least in comparison to non-Internet media. So, why not? So… pretty standard stuff ad-wise. I’ll talk more about that a bit later. For all of my FB ads, I had them go to a lead form where people could submit their name, email, and phone. The idea (quite obviously) was that people looking for a web site would indicate their interest, I’d contact them, and we’d discuss their needs. Again, all pretty simple / standard stuff. What happens is that you have to monitor the ad performance yourself, and keep a constant eye on the “results” column (as shown here), and then download a CSV (or XLS) file and look through that to get the person’s info. The system is so large and convouted, though (understandable as they have to cater to billions of advertisers all wanting different features), that it’s very easy to miss a lead, and for many reasons. It’s just … really sucky. But, the absolutely unforgiveable part is that they do not actively alert you when a new lead comes in. I hope the reason that this is unforgiveable is obvious. But, just to be clear: There’s a reason that sayings like “strike while the iron is hot” exist. When a lead actively comes into a sales cycle, it’s never hotter than at that very moment. Within days, hours, or even (agruably) minutes, many opportunities can fizzle. Not a single response came back. I found this surprising. Six upposedly actual people (Facebook and Instagram users) clicked a form, freely gave me their phone number and email addresses, and then zero replied? Was that really the kind of lead I should be paying $25.24 for? In the end, it was a pretty small experiment on FB, I’ll freely admit. I spent about $150 for 6 “leads”, each costing me about $25. Well, that and I suppose the 2,821 impressions my company got out of it, which, granted, is also worth something. Of course, working in marketing myself, I understand that there is more to such a strategy, such as continuing to run the ads to build brand awareness over time, A/B testing, and so on. But, I just wasn’t happy. 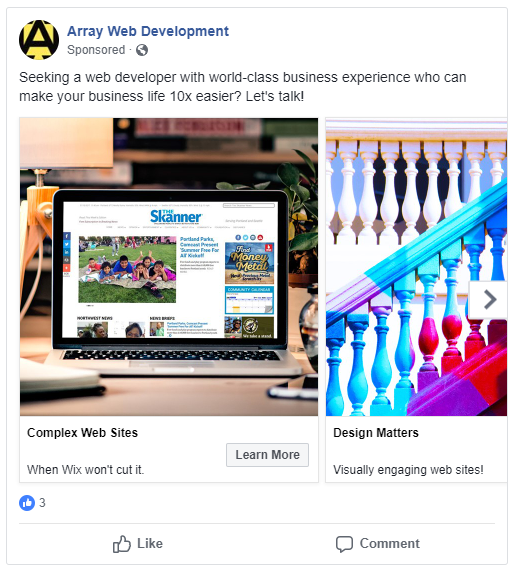 So, I thought to myself, “You know, maybe FB is the wrong platform for a web design company, anyway.” After all, I’m not really oriented toward consumers; rather, I’m oriented toward business people. Granted, FB has business people, too, and FB’s targeting technically can identify that segment. But, many of those FB business people are actually surfing the platform in personal mode, so to speak. LinkedIn, on the other hand, is much more focused. It’s the kind of social media that middle and upper management is more used to partaking of *while at work* (at least IMHO). So, I reasoned that my lead quality might improve on LinkedIn, and immediately shut down my FB ad account (after that admittedly ridiculous $150 test), and rebuilt the same content on LinkedIn’s ad platform. So, I decided to carry on w/ LinkedIn for another $150 or so, in order to compare the two. 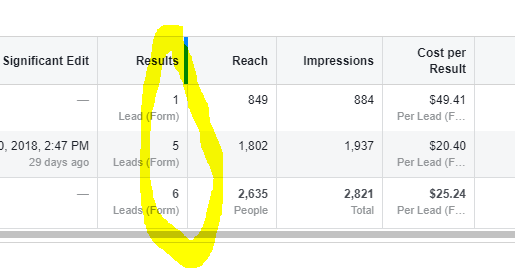 When I reached the same number of leads, I shut it off in order to compare stats. The LinkedIn numbers are quite similar to FB’s: LinkedIn showed 2,431 impressions at a $24.15 Cost Per Click — times 6 clicks = $144.88 spent. It’s funny how things work out just about the same, no matter the platform, isn’t it? I highly doubt that’s coincidence, as we’re working with two mature platforms — platforms that understand what they can get away with charging, no matter how much some small player like me criticizes aspects like the overly complex, confusing interfaces, utilities, and practices involved. In the end, LinkedIn was perhaps an insignificant amount less costly than Facebook, and possibly (arguably) offers a bit better targeting. I did particularly like how LinkedIn allowed targeting by title. Each platform had its plusses and minuses, but struck me as largely the same. As far as recommendations for clients, I’d say it would depend more on what you’re marketing — although if your budget can stand it, multiple-platform campaigns probably make sense. I’ve been in marketing for long enough to not have any grand expectations when it comes to advertising. Markets have an organic way of maximizing costs for client / customer acquisition. Whatever the profitability of your product or service, the markets adjust acquisition costs upward as high as possible. So, for me, as a web agency owner, to expect to be able to actually land even a mid-range client worth, say, $10–15k in exchange for spending a total of $300 on an advertising experiment … well, that would be unrealitic because far too much money would be left on the table by the ad platforms. Where that magic number is, though, I’m not sure — at least not for my own market, as I’m (very fortunately) primarily a word-of-mouth agency, and have luckily stayed quite busy via referrals, blogging (like this), and other means aside from ads for the past decade. Ad platforms, though, are indeed sure of these numbers. 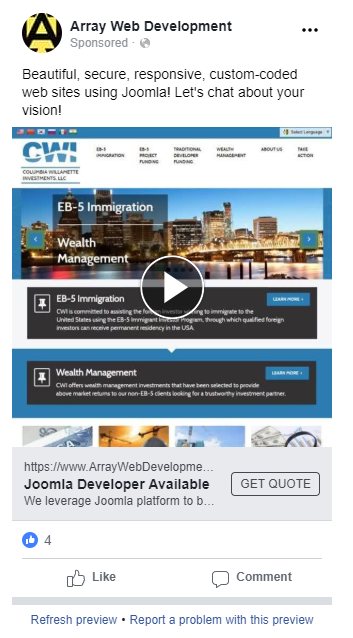 They may not know the exact profitability of a web design / web development client per se, but they know the average value of obtaining one, from the perspective of web design companies willing to compete for that ad space. And that, I suspect, is particularly driven by larger web development companies where the jobs are usually higher-cost. Also, the ads themselves could be the issue. I’ve included some examples here, just to indicate that they were, in my opinion, at least not unprofessional or ugly. They strike me a pretty standard, but perhaps did not pop enough. Certainly, ad quality must be part of one’s self-asessment. At the end of the day, though, after everything, I’ve not actually communicated with a single lead from either platform! Granted, there were only 12 total. But … how many human beings must react to an ad before it at least turns into, maybe not an outright closed sale, but at least a workable lead? About the Author: Jim Dee maintains this web design blog called “Web Designer | Web Developer Magazine” as well as his personal blog, “Hawthorne Crow.” He also contributes to various Medium.com publications. You can reach him at: Jim [at] ArrayWebDevelopment.com.